In the past, I have shown you a number of special vintage items that I have been given by my parents, including some great vintage drinking glasses and some wonderful pottery. I have also shown you many items that I purchased at thrift stores to feed my new shopping addiction. Today, I want to show you a bit of both. An entire box full of vintage scarves was gathering dust in my parents’ basement, so I took them home with me. My mom also gave me some scarf clips, one of which is pictured here. The question now is, what do I do with all of these scarves? (Just some of them are shown here.) Some of them are long and skinny, while others are square. I was thinking the square ones would make nice table decor. I want to thank my friend Wendy at Salt and Wine. She told me she would tie her new scarf around her handbag. Great idea! I just happen to have a few new purses that I bought recently at Value Village’s half price sale. They were only a few dollars each. I was clearly in the mood for colour that day. 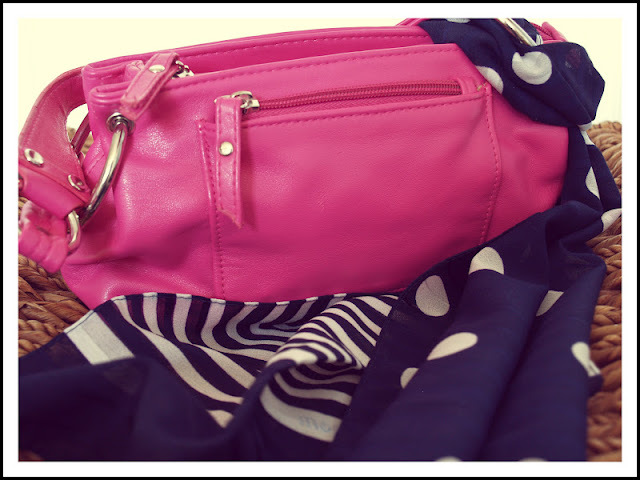 I chose small purses that won't weigh my shoulder down on summer day trips to amusement parks and shops. What about you? How do you wear your scarves in summer? If you have a link to your scarf photo, that would be great too! I love all the colors! It's funny how vintage scarves look so modern again. The new ones I spot in stores and the vintage ones in thrift shops aren't all that different. I wear them in the summer quite a bit, but then again my office is about 60 degrees with the A/C. I love the handbag idea...I'll have to steal that! Nothing new under the sun, huh? 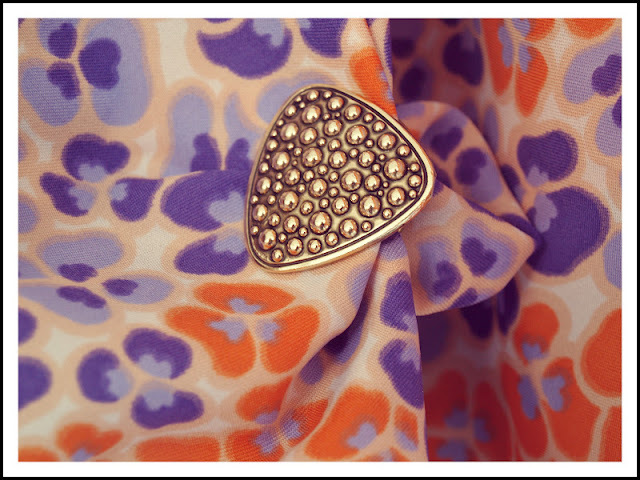 I'm sure scarf/fabric designers are looking at vintage scarves for inspiration! I love scarves. They've great for alternative gift wrapping - but I doubt you'll want to part with them if they are your mum's. The scarves do look great on your purses. A wonderful way to use all of them at some point. It's kind of fun to change them around too! 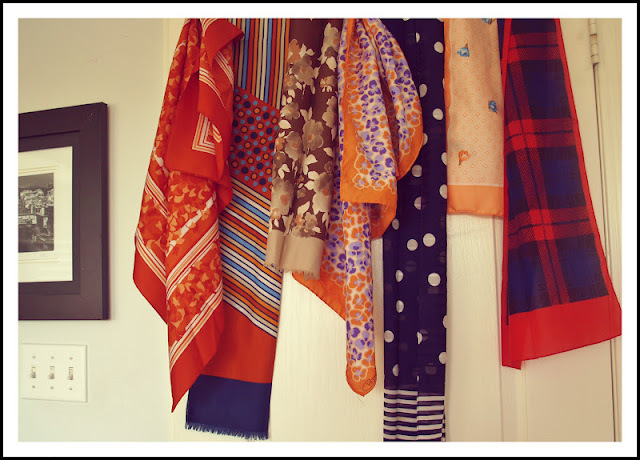 I LOVE vintage scarves. I mostly wear them in my hair, but I like to tie to them to purses, and wear them for cooler summer evenings. You have some great ones there! I have never been much of a scarf person, mainly because I am not confident about tying them. I will have to get used to it! Just beautiful! 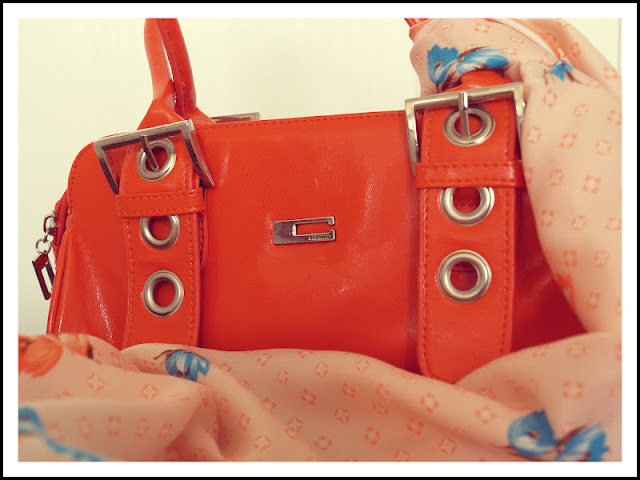 There is something so wonderfully feminine about vintage scarves & I ADORE the bags! They're beautiful and they match the purses so well! Thanks so much for sharing. So pretty and colorful- and I LOVE those drinking glasses! I pull my hair back in a bun and wrap them around the front part of it. I have photos of my grandmother wearing a similar style. Thanks of linking up! I would love to see that photo of your grandmother wearing her scarf. Must be so pretty! Thanks for hosting again! 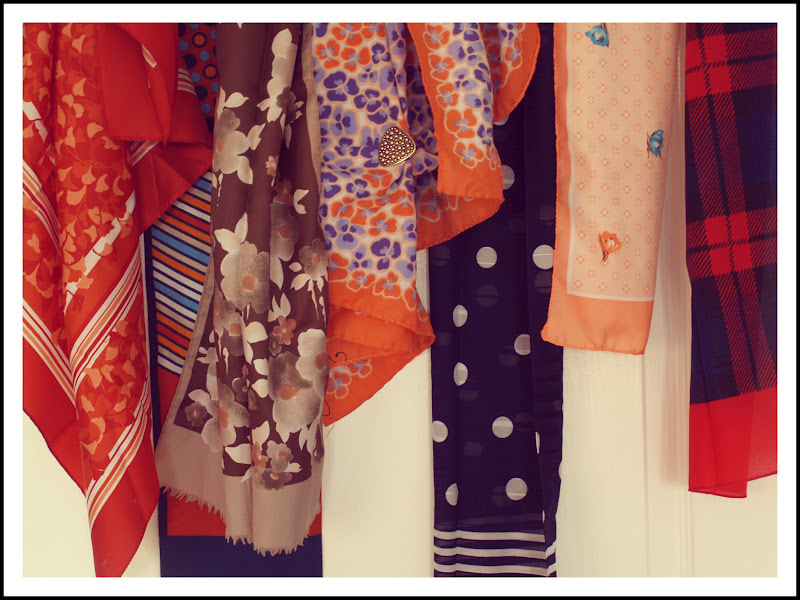 wow you are so lucky to have so many great vintage scarves. i am always keeping my eye out for them as there are so many great craft projects you can do with them. I am intrigued. Craft projects? Sounds interesting. 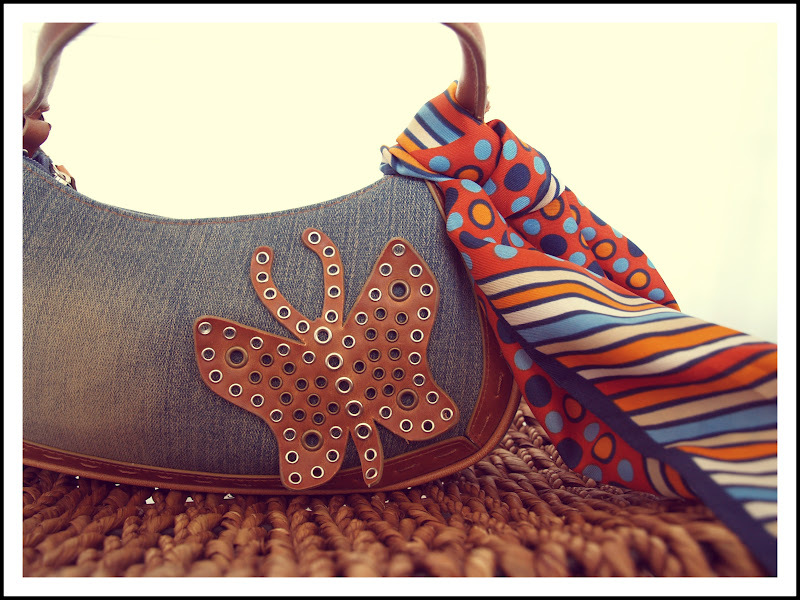 The denim and butterfly are so me! Love all your finds! That's the only one I have used so far. I love jeans, so I guess it makes sense I love that purse! Omg- I love them all - purses and scarves... and the scarves tied to the purses! Don't you love going through your parents stuff and finding a box full of treasures?! I have a bunch of my moms old scarves, too. They still smell like her perfume. :) Enjoy them, Joann!!! Glad you like them! :) Thanks for visiting! I just bought a bunch of vintage scarves yesterday at the Goodwill. I often think, when I buy a group, that they must have all come from from the same person. I love yours. They look terrific on the bags! I wear them loose in the summer and prefer the silk ones that breathe. I don't see much vintage stuff at our Goodwill. I guess you have to get lucky! Good idea to wear them loose in the summer! I am happy you like the scarves. Thanks for following!